Each fall, at about this time, a strange white blob, about the size of a volleyball, starts growing from the side of a silver maple tree near the entrance to Ashland. If you take the walkway from the parking lot to the center, you can’t miss it. A week or so after it appears, it develops long, stringy strands that dangle downwards like little fingers. 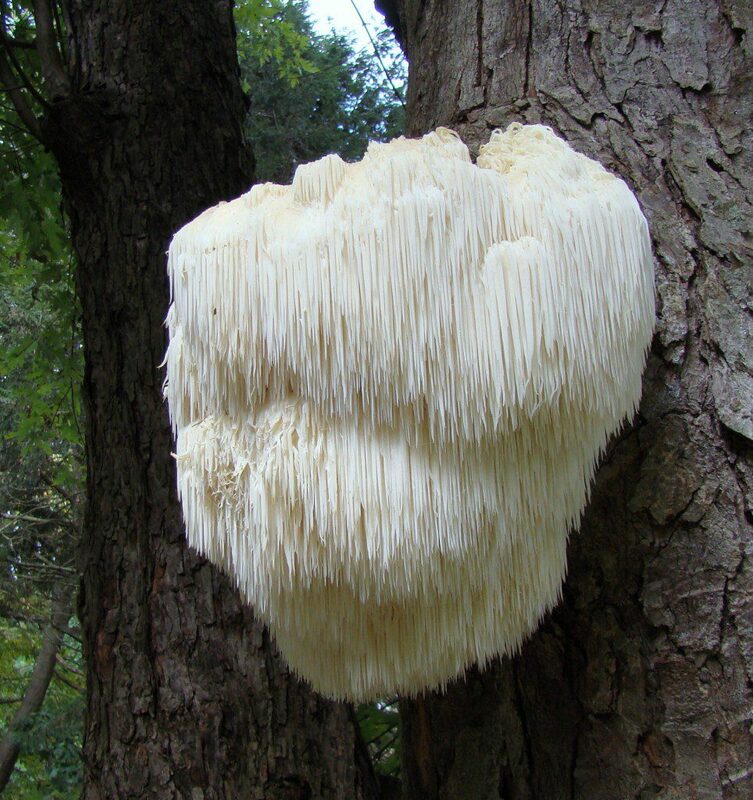 This beautiful, but slightly scary sight is a Bearded Tooth mushroom (Hericium erinaceus). 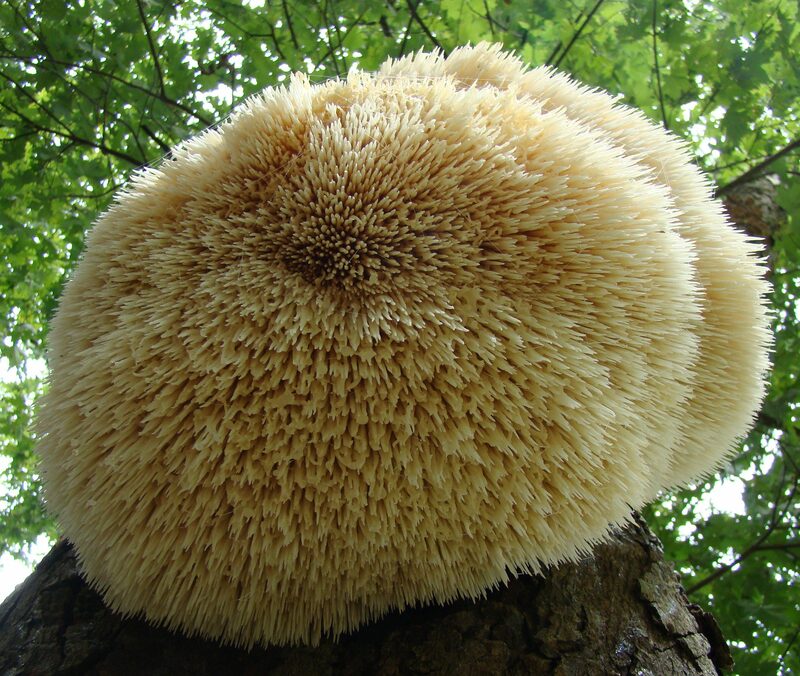 Among its other names are Lion’s Mane, Hedgehog Mushroom, Satyr’s Beard, and Pom Pom Mushroom. If you want to see it, you’d better hurry up. Soon it will start to rot and insects will damage it. But right now, it looks really cool. This Bearded Tooth, a type of mushroom, is currently growing along the entrance walkway to Ashland Nature Center. This is an edible mushroom, but only when it is young and first appears. It is said to have a similar texture to seafood like octopus and squid and the flavor of lobster. In Chinese cuisine, where they call it the “Monkey Head Mushroom”, it is substituted for pork or lamb. Apparently, this fungus is saprobic and parasitic, meaning that it feeds by decaying dead wood in the tree, but also attacks living tissue for nourishment. It is easy to see why another name for this fungus is the Hedgehog Mushroom. I took this photo looking up at the fungus. This fungus is found in Europe, Asia, and North America. Apparently it is quite rare in Europe. Do you want to try it without the hassle of finding and picking it? 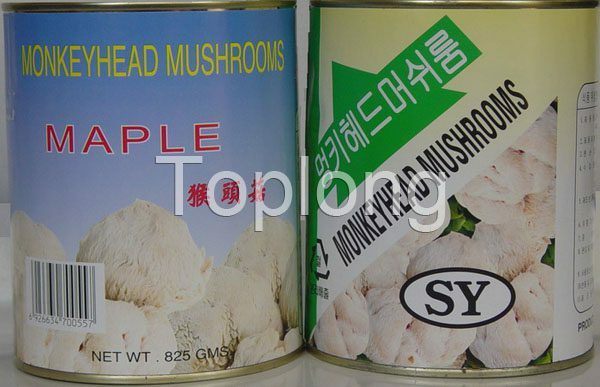 Here is a website I found where you can purchase “canned Monkey Head Mushroom” from China. Good luck! And don’t pick the one at Ashland!! Maybe you can find this mushroom for sale in a can!